Did you know that the 1621 celebration we base Thanksgiving on was not considered a day of Thanksgiving by the Pilgrims, but only a harvest festival celebrated with the Native Americans that was never repeated? That’s just one of the facts this interesting cookbook has to offer. 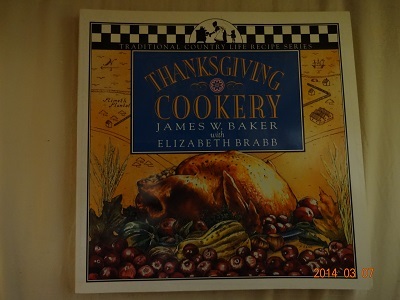 the First third of the book gives the history of American Thanksgiving and how the entire holiday originated out of the New England colonies. Several Congresses and presidents from Washington on tried to start a Thanksgiving holiday, but they were only isolated; no national holiday was started until Abraham Lincoln, and it traditionally became fixed on the third Thursday in November until FDR tried to make it the last Thursday in November in an effort to extend the shopping season for Christmas by one week. Sarah Josepha Hale was the mover behind the Thanksgiving holiday. She advocated for a return to a much simpler time befor industrialization started separating parents and children. She believed that a day set aside could strengthen the family. Of course, the South resisted the holiday for years because it had been introduced by Lincoln and it had come from the New England “Yankees.” The holiday was celebrated by custom until 1941, when FDR signed a law that officially created the third Thursday in November as Thanksgiving. How ironic that FDR attempted to create an extra week for shopping between Thanksgiving and Christmas, and it was the REPUBLICANS who killed the idea. I think an extra week would be preferable to having people work on Thanksgiving, which started with Wal-Mart and is now copied by Target and other heartless corporates. Sarah Hale would be horrified to see what has become of her holiday. So much for the day dedicated to family and food. A nice book about a wonderful holiday that’s being ruined. Warner Library serves Tarrytown and Sleepy Hollow. There’s a big browsing section of what new books the library bought. This is a fun cookbook. I love everything Halloween, and this book has some good suggestions for party ideas. Some of the recipes are how to cook something and, more importantly, how to dress-up food for the holiday. The Spiderweb Black Bean Burgers (p. 64-65), Chicken Enchilada Mummies (p. 66-67), Taco Monster Mouths (p. 68-69), Serpent Subs (p. 72-73) and Spooky Shepherd’s Pie (p. 88-89) are variations on recipes that most of us probably have or know where to get them, as well as how to make the food look spooky. There are some good recipes. I like the Candy Corn Cookies (p. 156-157) and Scary Cat Cookies (p. 158-159); these are clever and good-tasting cookies. The ideas on how to create candy-corn-shaped cookies with the same candy colors is very inventive. Some of the recipes are for simple, yet clever, snacks. Witches’ Brooms (p. 166-167), Grilled Ham and Cheese Boo Bites (p. 74-75), Scarecrow-d Taco Dip (p. 42-43), and Graveyard Bones with Dip (p. 36-37) are simple ways to celebrate Halloween without going to a lot of trouble. Meanwihile, Scary Pancakes (p. 94-95) and Spiderweb Pot Pies (p. 84-85) look delicious. These are definitely comfort foods. With these types of cookbooks, you have to remember that the brand names, in this case Pillsbury, are going to be mentioned. However, it’s easy to find a recipe to make the product that is the brand name. For example, for the Spooky Spiderweb Pizza (p. 78-79), a can of Pillsbury pizza crust is needed. There are so many recipes on the Internet for pizza dough that you can easily replace the can with your own (or someone else’s) dough. 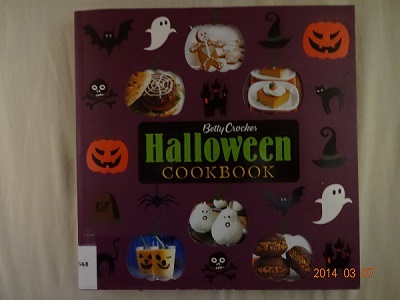 So, if you like celebrating Halloween and like food, this book is for you. You’ll get a lot of ideas here. I’ve always loved the idea of having tea. Tea time is one custom that the United States should have kept, but it was dumped with the British crown after the Revolution. This cookbook’s name says it all. I love scones. 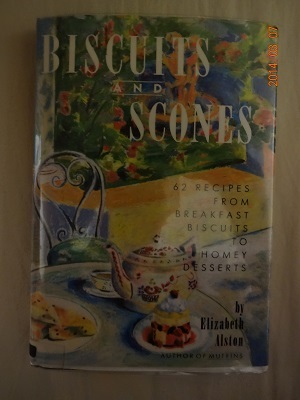 I made three recipes from this book, Peggy’s Cheese Scones (p. 42-43), the Fresh Herb-Olive Oil Scones (p. 48-49), and Hot Cross Scones (p. 30-31). I did not use all white flour but mixed it with whole wheat flour. I’m not a baker, but I’m sure this changed the consistency. However, the cheese scones turned out well as did the herb-olive oil ones, which I made two batches. The hot cross scones were okay; the consistency threw me, since hot cross buns are much lighter than scones. There are some great recipes. Besides scones, there are recipes for biscuits as well as shortcakes and a variety of other types of baked goods, both savory and sweet: Ham or Smoked Turkey Biscuits (p. 35); Biscuit Pissaladiere (p. 36-37); Dried Fruit Biscuit Strudel (p. 61-63); Coffee-Hazelnut Scones (p. 70-71); and instructions on how to enjoy A Devonshire Cream Tea (p. 86). There should be something for everyone in this collection. It’s an oldie but a goodie.